Phil Pickin returns to see a narrowboat which first caught his eye on a previous visit. SOME time ago I visited Perrydale Narrowboats at their base at Ashwood Marina to see their newest creation, Lady Grey. 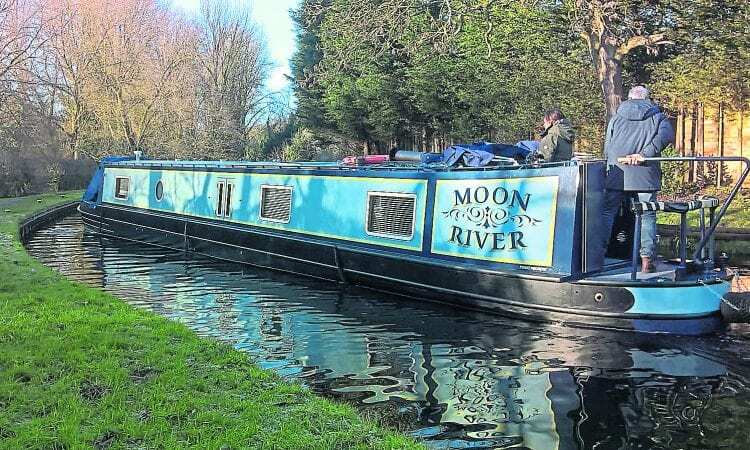 It was during that visit that Dave Perry enthusiastically showed me round what was, at the time, a partly fitted boat called Moon River. This 58ft semi-trad boat would, he pointed out, have some interesting and innovative design ideas – which is the reason I went back a few weeks later to see the boat when it had been completed. Having now seen the finished article I can understand what Dave means. The boat’s interior is a blend of Perrydale’s experience and attention to detail mixed with the owner’s skills as an interior designer. Although any design concepts are down to personal taste, the colour and layout of Moon River appeals to mine. The use of pale blue, grey, dark blue and natural wood makes a colour scheme that I find pleasing to look at and would be more than happy to live with. But let’s look at the detail. The stern is semi-trad with a curved rear counter, forward of which are the helm controls split to both sides of the boat. Between these and the door into the boat are two benches topped with wooden lids that provide access to the lockers below. The area is painted in dark blue which looks smart, and the stern is covered with a stern cover supplied by J&H Trimmings. 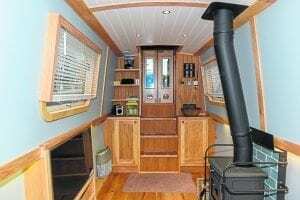 The other feature is a dog shower at the stern; a good idea to help keep the interior clean. Through the doors, you descend down three steps, each of which is hinged to provide access to more storage below. Either side of these steps are more lockers and shelves. It’s at this point that the colours and layout look, in my opinion, their best. The pale wall colours and white t&g roof help to break up the use of natural wood used around the ceiling trim, window surrounds and flooring. With the added use of dark blue on the galley lockers to the far end, you get a nice mix of colours and a very smart, modern interior with just a few traditional touches provided by the stools, the stove and a number of smaller items like the log basket. The main living area will, by the time you read this, have been furnished with a couple of free-standing seats. These will make the area into a comfortable space with the focal points being either the stove, on its unusual hearth and surrounded by grey tiles, or the 32in TV screen to the other wall. But having said that, the galley would seem to be the heart of the boat as it provides not only somewhere to prepare food but also somewhere to eat it. Large windows and hatches provide plenty of natural light which falls on to the large, chunky reclaimed wood worktop. Inset into this is the sink with no taps on view, a stipulation of the owners. Although the galley may not have every feature possible (no microwave for example) it does have plenty of storage with the now almost mandatory ‘magic corner’ – illuminated shelves, high-level oven and inset gas hob. The fridge and freezer are concealed behind the dark blue painted Shaker-style cupboard doors with their very retro handles and drawer pulls. Moving forward you enter a small corridor that provides access to the washroom and the forward berth. The most striking thing about this corridor has to be the floor. The tiles work perfectly with the style of the boat and it’s understood the owners stipulated that the pattern be random. 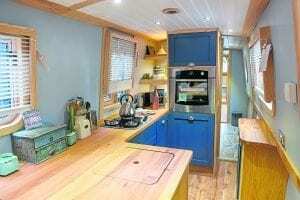 The result is the most eye-catching and stylish floor I’ve seen in a narrowboat. Off this corridor is a large shower cubicle and a separate toilet with what has to be the most unusual toilet I’ve seen. The toilet bowl has been fitted beneath an old-style bench fitted with a wooden seat. The style is further enhanced by the planking used to build the unit. 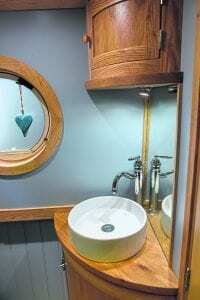 The result is the most modern-looking privy you are likely to see, especially on a boat! Apart from this quirky toilet (which hides a cassette toilet beneath it) the room has a stylish round basin over which a large tap is fixed. The round shape of the basin is reflected in the curved lockers above and below. The result is a unit that fits snugly into the corner and makes maximum use of the space on offer. From the corridor, you move into the main bedroom which is fitted with a king-sized bed, numerous lockers and wardrobes. Unusually, maybe, you can find the washing machine in one of the bedroom lockers. The thinking behind this is that you are unlikely to run the washer while you are in bed so why not put it ‘out of the way’? The bed folds out to its full size extending across the width of the boat. At the end of the room are a pair of glazed doors that lead you into what has to be the most unusual, stylish and useful area you’ll see on a boat. This ‘snug’ area has the look of something you’d see in a high-end motor cruiser, a look that is emphasised by the ventilation grille in the forward locker wall. The benches are upholstered in pale grey fabric which can make up another double bed. Two location points are fitted into the floor for a table which would make the area a great place to sit if it’s not being used as an additional berth. To make maximum use of the area a TV screen has been fitted on a bracket that swivels the screen between the main bedroom and the snug area, with the snug itself being covered by another J&H cover to match the stern. A row of LED lights in the roof round off the area nicely. Although many would mourn the loss of the storage available in a well-deck, I think making the most of the area in this way is a far more sensible option. In most cases, space is not in abundance in a narrowboat so making full use of an area like this seems a great idea. It’s great to see innovations and ideas being used, especially when they are mixed with a good design and these two elements would seem to have come together well in the making of Moon River. But ideas and innovation are nothing if you don’t have someone to make them a reality, so it would seem that all of these factors have come together to create this boat if the result is anything to go by. Pictured below are builders of Moon River, Nikki and Dave Perry.